The Northwest Kansas Museum Coalition is once again offering a great opportunity for individuals and families to explore the rich history in their own back yards. “Passport to the Past” encourages everyone to pick up a passport at any of 16 participating museums to start their adventure – and earn the chance to win cash prizes in the process. Passports contain information about 16 different museums as well as questions that must be answered by actually visiting the museums. Each passport holder, upon finding and writing down the answer to each museum’s question, will receive a stamp in their passport as well as a small treasure. Participants have until December 31 to visit as many museums as possible in order to be entered into the prize drawings. Those who visit all 16 museums will be entered into the drawing for the Grand Prize of $250; visiting 14 museums earns entry into the $150 drawing, while visiting 12, 10, 8 and 4 museums enters participants in drawings for $125, $100, $75, and $50, respectively. Participants from all levels will be entered in a drawing for five gift baskets made up of museum goodies. 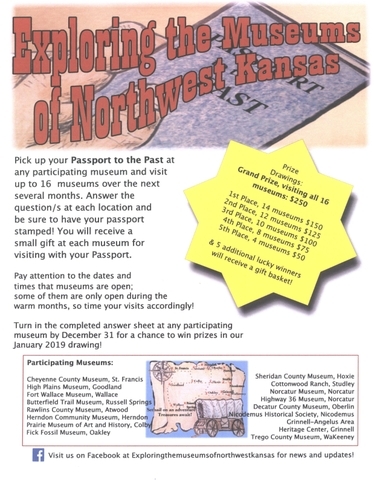 “Passport to the Past” began in 2017 as a project of the Northwest Kansas Museum Coalition, then a group of 8 northwest Kansas museums. This year, an additional 8 museums have joined the coalition, making the Passport adventure a whole new experience even for those who participated last year. Many families made this a weekend adventure, visiting two or three museums on a Saturday, having lunch in a different town and exploring area parks. Passports can be picked up at the following participating museums: Butterfield Trail Museum, Russell Springs; Cheyenne County Museum, St. Francis; Cottonwood Ranch, Studley; Decatur County Museum, Oberlin; Fick Fossil Museum, Oakley; Fort Wallace Museum, Wallace; Grinnell-Angelus Area Heritage Center, Grinnell; Herndon Community Museum, Herndon; High Plains Museum, Goodland; Highway 36 Museum, Norcatur; Nicodemus Historical Society; Nicodemus; Norcatur Museum, Norcatur; Prairie Museum of Art & History, Colby; Rawlins County Museum, Atwood; Sheridan County Museum, Hoxie; and Trego County Museum, WaKeeney. Several of the museums included in this year’s Passport program are open only during the warm months and have limited hours, so participants should plan their museum visits accordingly. Schedule information for each museum is included in the passport. For more information, check our Facebook page, “Exploring the Museums of Northwest Kansas,” or contact any sponsoring museum. A truly unique adventure awaits you and your family as you explore the museums of northwest Kansas with your Passport to the Past!